Dear friends and partners, good afternoon! You may remember our announcement that our Fellow Tsilla was a speaker at the 5th ICSD. Today we are proudly sharing with you the full manuscript that accompanied her talk, published as open access (CC-BY-NC) by the European Journal of Sustainable Development. Let us remind you the exceptional values that Tsilla represents, which we hope to push as the new normality here at SCImPULSE. 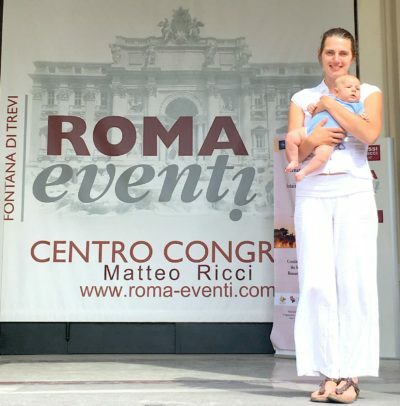 Tsilla is the young mother of two, and she traveled all the way to Rome with her young son Elias (say hello to him in your reactions 😉 Below is a picture of the two in front of the venues. In fact, Tsilla is devoting her passion and original thinking to prepare a better place to live in for the next generation. And she does so with the irreducible strength of a mother, who given the right support by her family and coworkers can achieve everything proudly, she sets her sight on. Please support her project, as she is an example for more than just transferring ideas from science to innovation. 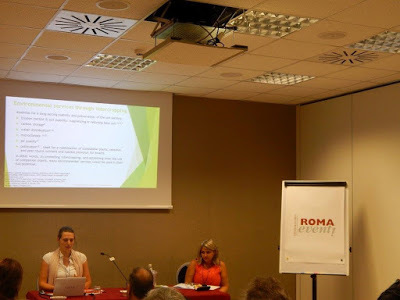 “I was thankful to have the chance to join the 5th International Conference on Sustainable Development(on September 6-7, 2017 in Rome, Italy) to share the system agriculture (codenamed “Resuscitation”) project, and our progresses towards a first botanical computational tool, and to meet other professionals interested in renewing agricultural theories and practices from other disciplines. The international speakers were representing sustainability from environmental, cultural, economic and social perspectives, which allowed for an interesting exchange of ideas and crossbreeding. In particular, additionally to methodic scientific questions about data retrieval, I received comments on the side of intellectual property rights or farmers’ concerns. I especially entertained interesting conversations with social scientist Dr. Anne Strøm Prestvik from NIBIO, who shared with us a study about pesticide use in Norway’s farm, and Dr. Romeo Ciminello from the Pontificia Università Gregoriana, an economist deeply invested in ethics, trying to design new development indicators to measure impact on human capital, rather than economic growth, or GDP. It was refreshing to discover a common interest in the ecological/agricultural input and output of the computational toolkit I am working on. I had the opportunity of learning about different land distribution issues in northern Europe and South America and was galvanized to learn about the success of sustainable farming and land management in various areas of Latin and Southern America. Among the many, I appreciated the lectures by Dr. Stefano dell’Anna about the experiences in Cuba, and by Dr. Roberth Villazon Montalvan of the Universidade Federal de Santa Caterina about the experiences in Brazil. I cannot exaggerate the value of these meetings, as they contribute to expanding and reinforcing the foundations of knowledge and strategies for the success of the type of soil management and farming I am working to promote. …well, after Tsilla’s words, there is not much that can we can add. Please, let this all sink, and let her energy be contagious. Support this project. You can offer your time and skills (there is always a shortage of good architects, expert coders, citizens willing to collect, test and share data in their gardens. Contact us and discover the unlimited ways you can support us. We also accept financial support. The SCimPULSE foundation is a Public Benefit Organisation (ANBI, 501(c) 3) registered in the Netherlands. Donations given to SCimPULSE Foundation are tax deductible.